This 2019 Sunset Park SunLite 16BH is 16'6’’ length ONLY 2480 lbs Our most popular line Sunset Park RV is the Sun-Lite Travel Trailer quality build by the Amish . This unit has a rear entrance with a bed in the front and the dinette table on the side that doubles as a 2nd bed. This RV is loaded with options like electric awning, outside speakers,, and more! We love these NEW 2019 Sunset Park RV arrivals! 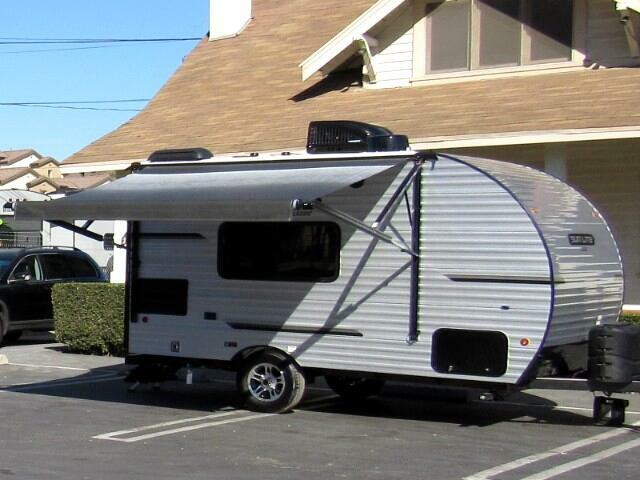 See us in Ventura to have a closer look at this Sunlite 16BH Tent Travel Trailer model. Fun Grey and Blue exterior and a spacious interior with enclosed bath. Awesome unit inside and out! LIGHTWEIGHT - Only 2480lbs lbs! Front Queen Bed; Enclosed Bathroom w/ Shower, and Toilet: Full Size Double Door Fridge,; Dinette Booth (makes into a bed); Microwave: 3 Burner Stove w/ Oven: LED Interior Lighting; Electric Awning with LED Light Strip; Radial Tires; Pre-Wired For Solar! Exterior Gas Line Quick Connect for Gas Grill; Outside Shower and more! Very good looking trailer! For more info please contact us today. Height including A/C - 9'7"
Message: Thought you might be interested in this 2019 Sunset Park RV 16BH.